Hey, I was watching "MASH" last night, and in one scene Hawkeye was knitting. And not just fake-y show biz knitting, but knitting with the yarn tensioned around his fingers.....just like me! How odd is that? I'm still in my knitting funk, but I started a sweater for Gus nonetheless from this book, which has many great older boy sweaters. These, as most boy's moms will tell you, are few and far between. Gus is still small enough that sweaters for him count as not-big projects, plus the sweater's knit with a double-strand of Rowan Felted Tweed at 3.5 sts/1". Shouldn't take too long, and then maybe I'll feel like starting a shawl. I watched "Invincible" this morning - it was great! Very sepia-toned, and I think they tried to go easy on the cheap sports cliches. 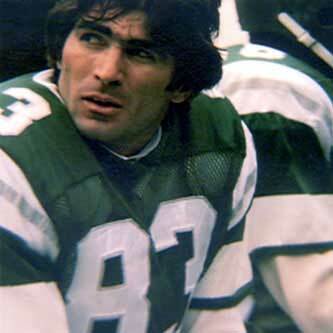 I had a big crush on Vince Papale when I was 13; can you imagine why? I loved Invincible too, but why (with the notable exception on Marky Mark) was every Philadelphian so damn ugly? Seriously fugly people in that bar! I think it was the abundance of bad facial hair - sideburns, muttonchops, handlebar mustaches...There were probably some good-looking guys under all that hirsuteness. I think it was to make sure Marky Mark looked good. I loved Invincible. I actually went to the theater to see it. "Vince Papale's only career reception, a 15 yard catch, was the last pass and completion of famed Eagles quarterback and College Hall of Fame member Roman Gabriel's career." Yo EPP - them's fighting words all around. First of all, we can't all live in the most beautiful city by the Bay and so all look healthy and serene and gorgeous year round. Second of all, I believe my favorite Princetonian's commenting ability has been curtailed by Blogger (not by me!) so he's probably at home, fuming because he can't chime in and root for the Tigers. Plus I don't think even he's going to put money on this year's team. It's Wednesday night. At least Princetonians can keep their days straight, even if they can't play basketball very well this year. Don't poke the orange and black bear, folks! WA HA HA HA!!! Good one, "Anonymous"!!! I knew you'd manage to chime in by hook or by crook.